Above is a real-life example of savings a customer can see. From left to right, an outright purchase, a refinance, and a Skelly Solar PPA. 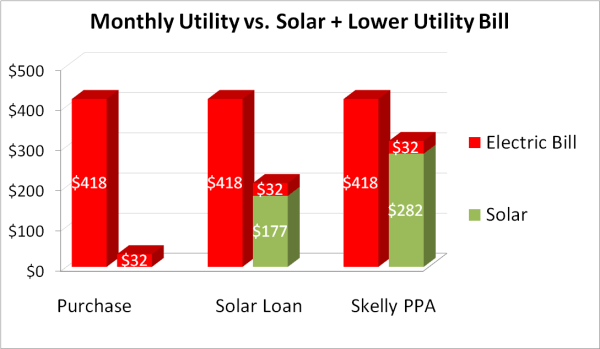 For customers looking for little or no up-front cost, we have partnered with Clean Power Finance to provide a $0 down Skelly Solar Lease — you save money starting the first month the system is installed! Every year, as utility rates increase, you save more and more! Financing terms and availability subject to change. Current requirements are a 700 FICO or greater, and located in Southern California. How does a solar lease work? A solar lease works much like a car lease. An investor will invest capital to install solar on residential customer’s rooftops for a reasonable rate of return. For example, Google just invested $75 million in Clean Power Finance, our finance partner, to help finance residential solar projects. In a solar lease, the investor technically owns, monitors, and maintains the solar system. By treating the solar system as a ‘commercial asset’ investors are able to capitalize incentives associated with a commercial solar system, and then pass the savings to the homeowner in the form of lower monthly payments.